Life with a newborn isn’t easy. Newborn babies mean extremely long nights with no consistent hours of sleep, diaper changes in a pitch-black room, and breastfeeding on demand every 2-3 hours. I’m so used to being the primary caretaker for our babies and kids. My entire day was scheduled around pick-ups and drop-offs but that’s all over now. I took a nanny role which requires me to be away from the kids most of the day. My husband who was always the daytime worker, now he’s going to be the hands-on superstar daddy because we’re switching roles! With Aria, I had the luxury of working remotely from home for the first two years before she went to school. This time, I had only 8 weeks before I had to go back to work. Ugh, playtime with my chicken nugget is over! It was the hardest thing ever to imagine being away from my little baby for 38 hours out of the week. I’m dreading all of the things I’ll miss if I’m at work whether it’s his first word or him learning to scoot around. I will actually cry if he walks for the first time while I’m away. The hardest part about going back to work is working out the logistics for childcare. He’s too little for us to feel comfortable going to a large daycare center. I’m horrified about the types of stories I see and read about regarding child care staff members harming or neglecting babies who are too young to speak or defend themselves. Luckily, Dezmond is a business owner so we were able to work out our schedules so that I could work until 6 and he will work evenings and weekends. That way, the kids will be with one of us throughout the day and not in the hands of a stranger. Aria is also old enough to be going to school full-time (until 3:30) so that allows him to focus his time on our cluster-feeding baby. I can’t say that switching roles doesn’t come without heartburn. We had to put in fool-proof systems in place so I wasn’t worried about the house burning down with all of them in it. Put everything in designated bins. Keeping yourself organized is key to making sure things go smoothly. For instance, we have 6 main bins. Diapers/wipes, burp cloths & linen, lotions and creams, daytime clothes & undershirts, jumpers, and outerwear/socks/shoes. Label everything. You can never be too thorough! Avery brand makes labels of all sizes that you can write on yourself or print them out on your home printer. Stick them on and reinforce them with clear packing tape on the front of your bins to “laminate” them. Make a baby manual. I have an entire PDF I created in Canva that’s full of info every new child caregiver would need. There’s a morning checklist, a health information sheet, a “where is it” location guide, emergency contact form, and diaper bag checklist. Re-stock the baby bag at night. Make sure that the bag is stocked with 8-10 diapers, a change of clothes, extra socks, a pacifier, a burp cloth, an empty bottle, changing table pad, and a pack of wipes. We also keep a lavender essential oil roller and natural dissolvable chamomile tablets for Sire just in case of fussy days or when teething begins. Pre-make bottles at night. Make sure you make 3-4 bottles and fill it with the desired amount of breastmilk or formula. I pump during work so that’s what he’ll eat until he runs out of it and then the rest of the day until I get home he eats Organic Similac bottles and resumes breastfeeding when I get off. It’s going to feel super weird for the first couple weeks, but I know I’ll get used to it. The most important thing to remember is that he’s healthy and he’ll be fine for a few hours each day while I have to work. I know he’s in good hands with his daddy who magically has a newfound respect and appreciation for stay-at-home moms and understands that work productivity can be drastically impacted when you have a small baby. Who woulda thought?! For all my working mamas, when did you go back to work and where did you find help with childcare? Dezmond “Sire” Seifu was born on Friday, 10/26/18 at 9:06 am. Side note: Labor for Aria was terribly different and set unrealistic expectations for this new baby. I went from 2 cm dilated to 10 cm in 24 hours with her. Our hospital was about an hour away from where we’re currently living in comparison to being 10 minutes away from our studio that is located in Washington DC. I figured, the worst case scenario was that I would stay with Dez at the studio if I felt like I was going to go into labor. So, the day my contractions started, I immediately was alert and excited. As you may know, the closer the contractions are together, the closer you are to delivering. The contractions I had that day went from 30 minutes apart, to 10 minutes apart, to 5, and it stayed like that for about 12 hours before they stopped completely. I had even called the midwives to alert them that I may be coming in if they intensified, but they didn’t. I was shocked. I had my hospital bag packed by 35 weeks so I had everything in the car ready to go! Hospital bag, check. Newborn carseat, check. At 10:00pm that night I felt the contractions start up again, this time they were more intense. I happily got in my car and drove to our studio, where Dez already was, thinking our boy would be arriving soon. I stayed up, waiting and hoping it was true. I just knew that I wouldn’t have a long labor this time. The midwives warned me to move faster this time because labor is about half the time the second time around. If the first time labor was eight hours, I was expecting to be in labor for about four hours this time. I finally fell asleep on an air mattress around midnight, thinking that any intense contractions would wake me up out of my sleep. The next morning, I woke up early and was still pregnant, sigh. My contractions consistently came and went for days and days, leading me to become frustrated, emotional, and strained physically. Luckily, I had a doctor’s appointment the next morning in the city, so I got dressed and went to see the midwives as normal for my 39 week check up. When I arrived, a midwife named Virginia greeted me and decided it was time to check my cervix. I was dilating but it was only at 2cm which was disappointing. She said it could stay like that for days or a week. Yikes. How was I feeling during this pregnancy? MISERABLE by the end. Carrying boys is SO different than carrying girls. Sire ran out of room in my body weeks before he arrived. He would kick the hell out of my sciatic nerve which is the long cord that runs down your back down to your legs. It cuts off feeling through half of your body if it’s struck hard enough. I didn’t have any of these pains when I was carrying Aria. He kicked my nerve so hard one day that my sister-in-law had to bring me ice because I couldn’t walk for three hours. He would sit on the nerves that operated my legs and would cause them to go numb for seconds at a time, often in front of other people who I’m sure thought I was seizing or needed serious medical attention. FINALLY, a week went by, and I was in the city again at the office. I was with Dezmond working late and was exhausted. I decided to bite the bullet to get a nicer air mattress from Walmart, some soul food from Oohs and Ahhs (the best soul food in the DC), and to get comfortable at the studio for the last time. I woke up about 4:00am with very intense contractions and felt relieved because it was finally time! I gently woke up Dezmond to tell him the news! I knew the contractions would get more intense, but decided I definitely needed an hour or two more of sleep before we went into the hospital. I recall being up literally all day the day Aria was born between nurse check ups and visitors, the hospital is a place where rest rarely happens. At 6:00am we packed our things and headed to the hospital. Unfortunately, we had the hardest time finding the ER entrance, which was something I knew was inevitable. We had missed our hospital tour more than once and we could have easily avoided this dilemma altogether if we had made it to any of our tour times. We had Aria with us, and I couldn’t walk far distances, so Dez let me out at the ER entrance so he could park, grab all our bags, and lead Aria in. I walked to the attendant’s desk and let them know I needed to go to Labor and Delivery. They called a transporter who wheeled me to the fifth floor. When I got there, it dawned on me that I had left my wallet in the car. All I had was my cell phone and a bottle of water. The security guard started asking me questions about the nature of my visit. I told her I was 39 weeks pregnant and was going into labor. The desk was crowded by nurses but for some reason, they asked me “how I knew I was going into labor?” I told them that my contractions were strong and that I was already dilating the week before. Like an angel, Virginia floated in to the room and smiled at me. I felt relieved she could vouch for who I was to speed up this idiotic intake process. They took me into the triage room to have me answer more questions while they put an IV needle in my arm and started tracking the contractions with a belt around my belly. Once they finished they wheeled me into the hallway to take me into the delivery suite. There, holding all our baggage, was my amazing fiancé who had our loud, energetic toddler in tow. Luckily we had an iPad with us and headphones to keep her busy. We finally got to the room and it seemed like it took an eternity to connect the device to wifi. The midwives who were on call and assisting me were two lovely women named Brenda and Alkita. They were two of the only midwife nurses I had never met, but it didn't matter. They made sure I was comfortable and spoke to me in calm soothing voices. They continued to monitor me and the baby and helped me breathe through the unbearable stage of labor where every contraction feels like it’s ripping through your body. They placed cool rags on my face and told me I could walk around and move if it helped me. I knew it was time for me to push within a half hour of being in the delivery room. I started pushing on my back, but something told me to flip to my hands and knees which is a position I researched about more comfortable natural birthing. I opted for no medication again?which I realize some people think is crazy but I find it to be empowering and beautiful. I know how much pain I can stand to bring our children into this world with limited assistance by doctors or medicine to speed up or slow down the process. On my hands and knees I pushed and Sire came out crying. Beautiful and raw. Aria was in the room and her dad shielded her from the graphic part but she was one of the first faces to greet her new brother. My nose started to bleed, something that has never happened in my life, and the rest was a small blur until they placed our son in my arms. They handed him to me, cord still attached to the both of us. I laid there with him just soaking up all those moments until the midwives asked Dez to cut his umbilical cord. We bonded skin-to-skin for about an hour just embracing each other. I was absolutely in love with him from the very first time he was handed to me. Ah, my boy. His delivery was fast and smooth. We are absolutely blessed to have had two beautiful, uneventful, natural births. It was a wonderful thing to be able to have had calming midwives who allowed my whole family to be together in the room to witness the birth of our new family member. And just like that, we went from a family of three to a family of four. We are slowly transitioning into our new lives with two. We have no routines yet at 6 days in. Dez took a few days off from work to help us get situated which was amazing to have his help in the first few days. We’re just learning to balance the needs of both children and figuring out Sire’s personality. The house has gotten a lot quieter now that we have a sleeping babe around. Aria is still learning about her “inside” voice. I have a feeling, learning that will take some time. In order to help her adjust to all the changes that come with having a new baby and sibling, we made her room feel more “princessy” and grown up so she wouldn’t feel left out of getting all cool new gear and so she would enjoy spending time in her room. I think it helped ease the jealousy of having a new baby being in our room with us too. She’s a wonderful, attentive big sister already. She holds his hand and sings to him which melts my heart. We’re happy she loves him as much as we do! Happy birthday to our son Dezmond “Sire” Seifu. We are so lucky to have you. It’s possible to create a decorative nursery nook in your own room! Three years ago, we were lucky enough to have an entire room in our last home to set up to create an amazing little gender-neutral nursery for Aria. This time, we only had the ability to utilize the space in our current bedroom to create a functional and decorative nursery which initially was frustrating and seemed impossible! It’s amazing what some re-organization of room furniture did for us to open up usable space to insert the basics that we’d need for the first six months. To prep for the baby furniture, we moved our gigantic (and heavy) bed to the far left of our room, and slid the dresser with the TV over as well. We measured the space that we had left which was three feet for the changing table and about 3 feet for the bassinet on the opposite side of the bedroom door, close to my side of the bed for nighttime nursing. We decided that we would only purchase what we needed in the room immediately. Unfortunately, we had sold everything except the Doona stroller/carseat and Rock-A-Roo swing from when Aria was a newborn. Changing table from Facebook Marketplace. I’m obviously a huge fan of DIY things so I bought two cans of flat black paint ($10.00) and painted it black. I finished it with a coat of matte coating and wiped it down thoroughly once it dried completely for 2 days. Three sets of stainless steel baskets in a grey color from Amazon. The baskets came in two different sizes, so the smaller baskets with the diapers, burp cloths, and accessories are on the first shelf and the bigger ones with clothes in newborn and 0-3 month sizing are at the bottom. Wipeable changing pad from Bumbo in grey. Little boys are known to be the ultimate pee-ers while you’re changing them so cloth covers were out of the question. Accordion Wall Rack in Grey from Amazon. Clearly, this buy was more for decoration, but I wanted to have a place where we could hang hats and cute little jackets. I stand by the idea that this was $20.00 well spent. Skip Hop night soother for music and illuminating projections. The projector is amazing for soothing baby to sleep after night feedings. Extra long wall tapestry from Wayfair. We had a hole in the drywall from when our nephew was the room’s occupant which was a total eyesore. I also felt like this piece gave me so much inspiration for incorporating texture. Oasis Bassinet from Baby Planet in the color Graphite from Amazon. You always need a sturdy crib or bassinet. I originally was looking for a Moses basket but ultimately decided we needed something more modern looking! Snuggle-Me-Organic lounger in the standard size. We chose the color Moss because of the dreamy green tone. We also bought back up covers just in case of an unexpected accident. Modern Black Gem Mobile from Pottery Barn. I wanted something clean and modern with no gaudy colors or animals on it to stimulate baby. Oval-shaped rug from Target. We needed something that tied together the colors from the Tapestry and the changing table. You really don’t need all the decorative items if you are really only purchasing the necessities for your room. I find that adding little touches of decor makes you appreciate your space so much more! What were your nursery must-haves? Feel free to share with me what your life-saving purchases were! Talkin' First-Time Pregnancies With MTV's Cheyenne Floyd! Talk about pregnancy glow! Cheyenne rocked form-fitted and bump-enhancing maternity style. 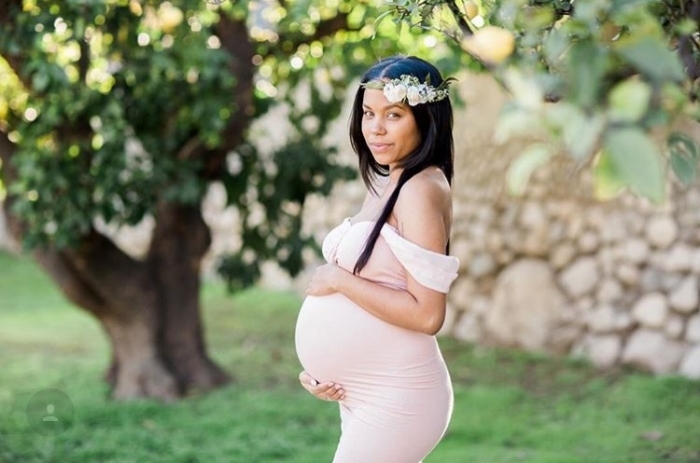 I got the chance to catch up with MTV AYTO star Cheyenne Floyd who is expecting a pretty little girl in a few weeks- and she has been effortlessly glamming her way through pregnancy I might add! I've been dying to ask her the questions we've all been asked when we were #youngdumbandmomming for the first time. A. Cole: What is your biggest fear becoming a young mom? Cheyenne: I am so excited to become a mom that I haven't let fear in my heart. This is such a blessing and positive time in my life that fear has not been a part of. Between meditation and educating myself on what is going on with my body and labor I am at such a calm place. Combined with the support that I have and my mother I am just ready! A. Cole: What are the unexpected things in your pregnancy you wish someone had told you? Cheyenne: I wish I knew how bad heartburn was! I have had the worst heartburn and nobody told me how much it would effect my pregnancy. I also did not realize how much my eating habits would change, certain foods that I normally love i can't stand to look at now. A. Cole: Where do you experience the most pain now that you're in the final stretch? Cheyenne: The final stretch has been the hardest part of my pregnancy. My first two trimester were a breeze compared to these last few months. This last month I haven't slept, I am constantly uncomfortable and the biggest I have ever weighed. Honestly getting out of bed is the most painful haha! A Cole: Has sleeping been harder in this last trimester? If so, what do you use to help you sleep? Cheyenne: Thank God for my friends who have been there for me from day one of my pregnancy, they have helped me a lot with all there gifts. One of those were a huge body pillow that takes up about half my bed. I don't think I would be able to live without my pregnancy pillow. Along with taking heartburn medicine before bed and have a bottle of water close by. A. Cole: Do you worry that your friends or people your age wont be able to relate to you the same once your priority is baby Ryder? Cheyenne: My support system is incredible, my family an friends are going to love Ryder and already understand that she is my mine priority. I am the first out of my friends to have a baby so it will be new to all of us and a learning experience. A. Cole: What was your favorite part about being pregnant? Cheyenne: My favorite part about being pregnant has been watching my belly grow and feeling her kicks. I love feeling her move around and hearing her heartbeat. It's been such a life changing experience and crazy to watch my body grow to create this little girl. I can't believe that I have been so blessed to have her and now all I can do is patiently wait for her arrival. It's amazing to know that we all share similar maternity experiences- whether we have boys or girls, pregnancy takes it's toll on the body! Thank god we are rewarded with the cutest nuggets to make up for all the pain and heartburn. Thanks Cheyenne for sharing with us today.